The dB Blocker™ Classic Intercanal is ideal for those going in and out of high volume sound fields over the course of their work day. It is custom fit to the individual wearer for maximum comfort using Skinsoft™ medical silicone, and its helix free design makes it easy to insert and remove. Classic dB Blockers™ are hearing protectors that are actually comfortable to wear. Most hearing damage arises when an ear plug is removed for conversation or comfort. Classic dB Blockers™ are made to fit the individual’s ear exactly and stay in place without applying pressure to the ear so comfort is not an issue. This gives the worker a product that provides effective hearing protection and stays in the ear all day long. 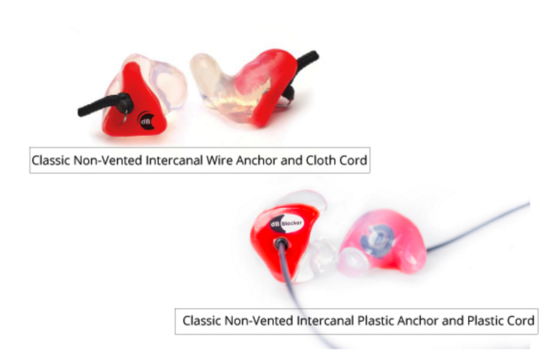 At Custom Protect Ear we provide specific warranties for our customers: the FitRight Guarantee & Product Warranty.